Open streets movements are spreading worldwide, nowhere faster than in India, where two of the countries largest cities now close major roads to cars every Sunday to reclaim public space. Photo by Raahgiri Day, New Delhi/Facebook. Do the streets in your city belong to people or cars? In more and more cities worldwide, residents are taking back their streets as public spaces. The open streets movement started in the 1970s with “Sunday Ciclovía” in Bogotá, Colombia, where to this day, 121 km (75 miles) of roads are closed to cars and buses every Sunday. Weekly and annual open streets events have expanded to cities worldwide in recent decades. 2014 was a year of major growth for the movement. 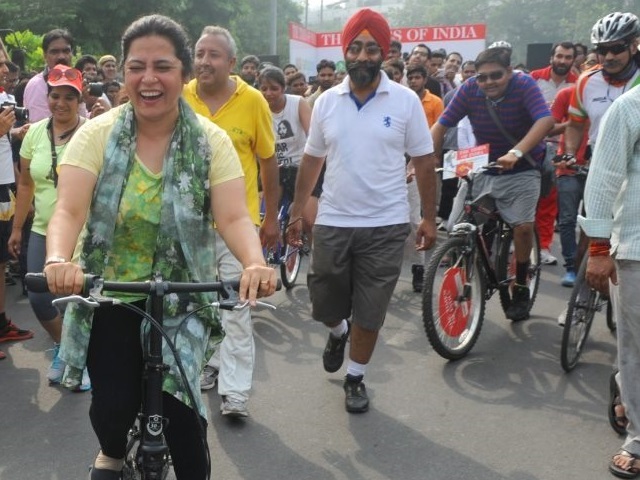 The best example is Raahgiri Day, India’s open streets movement that has expanded from Gurgaon in 2013 to six more cities in 2014, including capital New Delhi. This low-cost, high impact strategy can improve quality of life, provide opportunities for recreation and sustainable transport, and unite citizens around the idea that streets are public spaces that should people’s needs. Beyond the weekly events, open streets events advance efforts to create safe, attractive spaces for people and active transport options like bicycling and walking. Now in Gurgaon, Delhi, Bhopal, Ludhiana, Navi Mumbai, Indore, and Dwarka, Raahgiri events draw tens of thousands of participants weekly in these seven Indian cities. In Gurgaon, nearly 90,000 people came out for Raahgiri in its eighth week. When these cities close major roads to cars on Sundays, it allows people room to bike, walk, do yoga, Zumba, aerobics, and much more. Mumbai has recently launched its own open streets movement called “Equal Streets – A Citizens Movement,” and it has quickly gained momentum. In its first four weeks the crowd grew to approximately 40,000 people. India is a particularly important country for the open streets movement, as increasing car ownership contributes to serious air pollution and road safety problems. In late January 2014, Delhi’s average daily peak of harmful particulate matter was 20 times the level considered healthy by the World Health Organization (WHO). Meanwhile, 330 people die each day on India’s roads. Raahgiri and Equal Streets advance a different path for Indian cities, one that prioritizes sustainable mobility, public space, and quality of life. 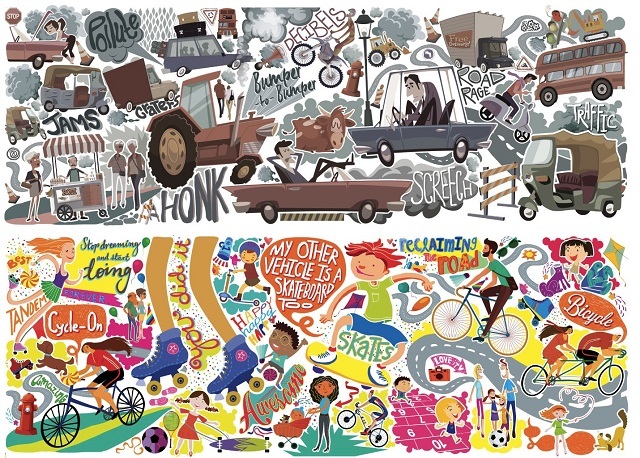 This graphic from the official Times of India contrasts the vibrancy of a road closed to cars during Mumbai’s Equal Streets event with a dangerous, polluted, and congested road on a typical day. Graphic via official Times of India. Istanbul has taken a different approach to turn streets into true public spaces for people. Since 2011, Istanbul has pedestrianized 295 streets throughout its Historic Peninsula, closing the streets to cars and creating safe, accessible, and attractive spaces for community interaction. In 2014, EMBARQ Turkey released the Istanbul Historic Peninsula Pedestrianization Project report to investigate the impact of this pedestrianization. After surveying students, residents, and local business in the Historic Peninsula, EMBARQ Turkey found an 80% satisfaction rate with pedestrianization. Fifty-five percent of respondents felt that transport modes are more accessible by foot, and respondents also reported decreased noise pollution and improved air quality. What’s next for open streets? Over 100 cities now have open streets events, and the events have been shown to be effective in cities of all types, from Latin America, to the United States, to India, and beyond. As many cities face rapid growth and increasing car ownership, they are challenged to provide public spaces where people can be safe and active. The Journal of Urban Health estimates that the benefits in reduced medical costs from open streets events substantially outweigh the costs of closing infrastructure to cars. This movement has sparked a ray of hope in many cities in India, which now realize that non-motorized and public transport will be the chosen modes of transport in the future. We have been hearing from passionate citizens and public agencies from different cities in the country, who have shown interest in replicating this initiative.